Bake at 350Â° for 10 minutes or until golden brown. I forgot about these! 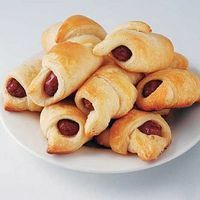 I'm going to make these for kid appetizers at Thanksgiving. Yum! I'll make extra for those adults that sneak a few. I just tried these. They are very good. I added bbq sauce to the dough before rolling. this recipe dates back to the 1950's but it is still yummy. Add a little of your fav mustard for perfection. Dijon? Spicy brown, yellow kids' stuff? Easy Peasy - made this for lunch today. Not healthy in the slightest but hubby and kids gobbled them up. We just warmed some nacho cheese for dipping. I've done this many times - great recipe. I also like to use breakfast sausages (and cut the each roll in half instead of thirds). Delicious with pancake syrup or honey as a dipping sauce. BBQ sauce or hot mustard are also good. I am curious about this recipe. I should give this a try soon. These are so addictive! I just love them! Wow this recipe has been made in so many different ways. My family loves them we have them sometimes for brunch.